Carbohydrates have been stereotyped as fattening, high in sugar, and overall unhealthy. This is not true. Sure, some carbohydrate foods are high in fat and sugar and are unhealthy, but many are not. This post will explain what carbohydrates are, why you need them, and what foods contain carbohydrates. Carbohydrates in its simplest form is broken down into saccharide (sugar). There are four types of saccharides: monosaccharide (1), disaccharide (2- monosaccharides), oligosaccharide (3-9 monosaccharides), and polysaccharide (10+ monosaccharides). Monosaccharide and disaccharide are simple carbohydrates and are digested quickly. Oligosaccharide and polysaccharide are complex carbohydrates and are digested slowly. Monosaccharide are the simplest sugars and cannot be broken down any further. They are glucose, fructose, and galactose. An oligosaccharide example is fructo-oligosaccharide which is found in fruits and veggies. Polysaccharide examples are starches, glycogen, and cellulose. Simple carbohydrates are carbohydrates that are in their simplest form, such as sugar and juice, and foods that are highly processed with their fiber stripped, such as donuts and white bread. Simples carbohydrates are best eaten before and after a heavy weight lifting session or a HIIT workout when you need quick energy and to replenish glycogen in the liver and muscles. Any other time, it’s best to eat simple carbohydrates with a protein and fat to help slow down the digestion and absorption of the carbohydrate. Simple carbohydrates eaten alone will spike blood sugars quickly. Complex carbohydrates are carbohydrates that take more time to digest. They consist of foods that are minimally processed and have fiber, such as whole grains and vegetables. Complex carbohydrates are best eaten with most meals. Fiber is a non-digestible carbohydrate and lignin that are found in vegetables, fruits, legumes, nuts, seeds, and whole grains. Fiber is found naturally in foods and are also artificially created. Carbohydrates are the body’s preferred energy source. It provides quick energy for your cells, tissues, and organs. Glucose (blood sugar) is the brain’s preferred energy source. Muscles uses glucose for quick energy and the liver uses glucose for processing and metabolizing nutrients. Muscles and the liver are able to store glucose in the form of glycogen for later use. Fiber plays an important role in the body. Fibers that form a gel-like substance slows glucose absorption, improves insulin production, and reduces LDL cholesterol. Fermentable fibers are used by healthy gut bacteria to reduce chronic inflammation that causes diabetes and heart disease. Insoluble fibers, roughage fibers, increases the speed at which food and waste passes through the intestines, improving colon health. Fiber increases satiety by adding bulk/volume to foods and improving weight management. Read the article I wrote earlier this year for more information on the benefits of fiber. All plant and dairy foods contain carbohydrates. 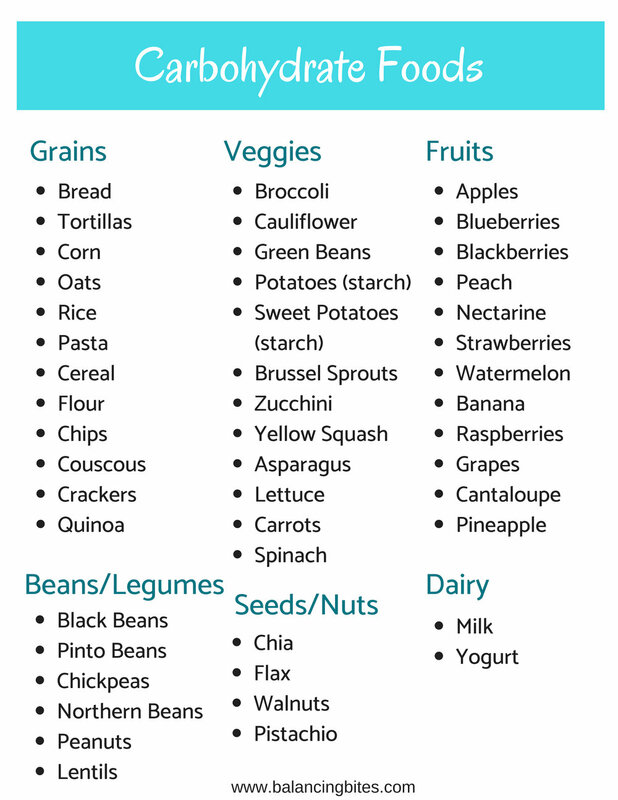 Those include whole grains, fruit, veggies, beans, lentils, legumes, seeds, nuts, and dairy. How much carbohydrates should you eat? The amount of carbohydrates you should eat really depends on your activity level and goals. Unlike protein and fat, carbohydrates are not essential. Meaning you don’t technically need them to live, so there isn’t a set amount needed. If you didn’t eat carbohydrates, your body would produce ketones. Is this an optimal way to live? Absolutely, not. But, for some people, such as those with epilepsy, restricting carbohydrates can greatly improve their life. I recommend getting most of your carbohydrates from complex carbohydrate sources and limit simple carbohydrate sources. You can adjust the amount of carbohydrates you eat based on your goals. Start with approximately 40% of your total calories coming from carbohydrates, 30% from protein, and 30% from fat. Then you can adjust from there. If you would like more information regarding how to set your macronutrients, send me an email.